Offering military support to Iceland, thanking the US moderator for separating Crimea from Ukraine and quoting a former American president, Vladimir Putin found plenty of opportunities for humor during the serious Arctic forum in Russia’s Arkhangelsk. The forum’s moderator Geoff Cutmore of CNBC couldn’t refrain from asking Putin about the current poor state of relations between Moscow and Washington, caused by accusations of Russia’s meddling into the US election, the issues of Ukraine and Crimea and others. “I want to thank you that raising this issue you said that there are [separate] problems of Ukraine and Crimea. You kind of separated Crimea and Ukraine and that’s right,” Putin stated. 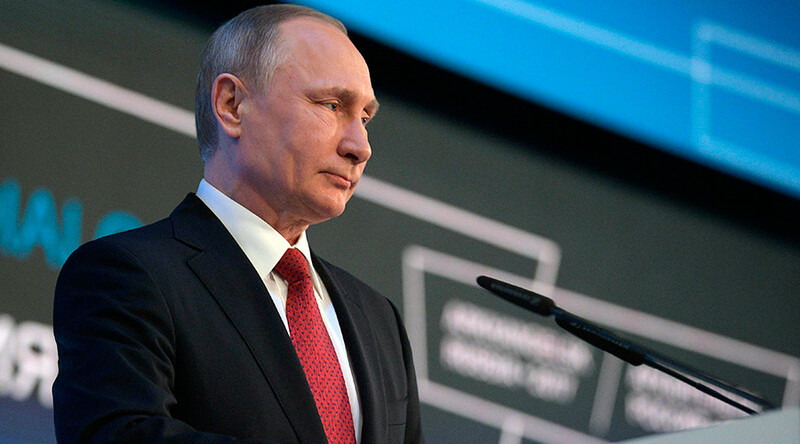 The groundless accusations of Russia’s alleged meddling into the US election were again addressed later during the forum, with Putin firmly dismissing them. “Once Reagan, discussing taxes, addressed Americans, saying ‘Read my lips – No’!” the Russian leader said. Finland’s leader, Sauli Niinisto, addressed the issue of heated tensions in the international arena by suggesting that the Arctic chill provided the best surroundings to put them out. “And it’s the hot Finnish guys telling us. We should take notice,” Putin said, making Niinisto laugh out loud. Icelandic President, Gudni Johannesson, said it would be hard to find countries with so many differences than Russia and Iceland. According to Johannesson, Russia is the largest country in the world by territory, while Iceland is a small Atlantic island, which doesn’t even have its own army. “Need help?” the Russian leader asked, jokingly offering military assistance to the Icelandic government. When asked if any guarantees can be provided that the development of the Arctic region wouldn’t harm the environment, Putin agreed that ecology must not suffer due to the economic projects in the area.